The School of Fine Arts was founded, with courses leading to degrees in architecture, landscape architecture, fine arts, and music. The course in architecture did not admit women, but the other three admitted women from the date of their inception. The School of Education appointed Edith Baer, B.S., to the faculty position of Assistant Professor of Home Economics. She was the first woman to serve as an Officer of Instruction in the School of Education and the first woman to be a member of the standing faculty at Penn. At special convocation of the University Council held in College Hall on 23 May, Madame Marie Curie, the distinguished French chemist and discoverer of radium, became the sixth woman recipient of an honorary degree at Penn. The Trustees granted her the honorary degree of Doctor of Laws (Hon. LL.D.) in recognition of her extraordinary achievement in scientific research. She was the second woman to be awarded the honorary LL.D. degree at Penn. Madame Curie was too ill to attend the ceremony in person, but her daughter, Ilene Curie, was present and accepted the degree on behalf of her mother. A few days later, Madame Curie was able to visit the University briefly and while she was on campus she signed the visitors’ register in the University library. At the Commencement held on 15 June, the University awarded the degree of Doctor of Philosophy in Economics to Sadie Tanner Mossell. She was the first African American woman to earn the Ph.D. degree at Penn. Margaret Katherine Majer (pronounced “Mayor”) succeeded Ethel Loring as Instructor in Physical Education for Women. Margaret Majer was an excellent athlete, who had excelled in intercollegiate swimming as an undergraduate at Temple University. She soon expanded her role at Penn and became the first coach of women’s athletic teams. She organized and trained a women’s basketball team and scheduled the first intercollegiate competitions for women. The women’s basketball team played eight opponents in its first year, including Bryn Mawr College, Drexel University, and Temple University. Teams in gymnastics, softball, swimming, and tennis were planned for the next year and Margaret Majer led a successful fundraising campaign to build women’s tennis courts on what, for a few years, was a vacant lot on the southeast corner of Thirty-Fourth and Walnut Streets. Margaret Katherine Majer was soon celebrated as the founder of women’s athletics at Penn. In 1924 she married Olympic oarsman John B. Kelly and subsequently became the mother of two Penn graduates, an Olympic medalist, and the extraordinary actress, Grace Kelly. Encouraged by work of Margaret Majer, undergraduate women formed an Athletic Association and elected four student athletes – Catherine Elizabeth Riggs (A.B., 1923), Genevieve M. McDermott (B.S. in Ed., 1923), Georgina Pope Yeatman (A.B., 1922), and Mildred Dougherty (B.S. in Ed., 1923) – the first officers of the Association. The Graduate School of Arts and Sciences established a graduate level course in business, leading to the Master of Business Administration degree. The first degrees were awarded in 1922. The School of Education appointed Helen Crandall Goodspeed, B.S., to the faculty position left vacant by the death of Edith Baer. As Assistant Professor of Home Economics for the academic year 1922-23, Helen Crandall Goodspeed was the second woman to be a member of the standing faculty at Penn. The School of Education appointed Ruth E. Michaels, Ph.B., A.M., to the faculty position of Assistant Professor of Home Economics. She was the third woman to be an Officer of Instruction at the School of Education and the third woman to be a member of the standing faculty at Penn. At the Commencement held on 18 June, Anne Hollingsworth Wharton, famous Philadelphia author and an authority on early American history and culture, became the seventh woman recipient of an honorary degree at Penn. The Trustees granted her the honorary degree of Doctor of Letters (Hon. Litt.D.) in recognition of her study of American history, her contributions to English literature, and her inspirational patriotism. She was the third woman to be awarded the honorary Litt.D. degree at Penn. Also at the Commencement held on 18 June, the University awarded the Bachelor of Fine Arts degree to Margaret Frances Coleman. She was the first woman to earn the B.F.A. degree at Penn. The University purchased an upscale apartment building at the northeast corner of Thirty-Fourth and Chestnut Streets and converted it to Sergeant Hall, a women’s dormitory and clubhouse. Sergeant Hall provided living and dining quarters for 175 women students, both graduate and undergraduate. It also hosted several women’s student organizations. The Women’s Student Government Association began publication of a women’s student newspaper, The Bennett News. Grace Marie Haspel (B.S. in Ed., 1925) was the first Editor-in-Chief of The Bennett News. This weekly paper went through twenty-three volumes before its name changed to The Pennsylvania News in the fall of 1947. The Pennsylvania News was published until the fall of 1964. In November, after thirty years of debate and nearly two years of construction, Bennett Hall opened at Thirty-fourth and Walnut Streets. It immediately fulfilled its purpose as the academic center for women at Penn. For the next forty years it was home to the School of Education and the Graduate School of Arts and Sciences, the two schools that enrolled more women students than all the other schools combined. Fifty years after the first women students matriculated at Penn, a total of 4,739 women were enrolled in seventeen different academic programs. The majority of women students continued to attend classes on a part time basis and were not candidates for degrees, but nearly 2,000 women were enrolled in courses leading to degrees. The School of Education, with 1,169 women working toward the Bachelor of Science in Education degree and the Graduate School of Arts and Sciences, with 552 women working toward masters and doctorates, enrolled more than eighty-five percent of full-time women students. Women were enrolled in eight of the University’s fifteen bachelor’s degree programs and nine of its eleven graduate and professional degree programs. In the undergraduate schools the courses in architecture, business, chemistry, and engineering were still closed to women, but in the graduate and professional schools only the courses in architecture and veterinary medicine remained closed. In addition there were 183 women enrolled in the University Hospital Training School for Nurses. They were also full time students. They aimed to complete the School’s three-year course and earn its diploma in nursing. Women were also beginning to appear among the several faculties of the University. In addition to Carrie Kirk Bryant and Ruth E. Michaels, both of whom had advanced to the rank of Assistant Professor by 1926, three others had held the academic rank of Associate – just below that of Assistant Professor – in the Graduate School of Medicine. They were Katherine M. Starkey, M.D., who was appointed Associate in Pediatric Hygiene in 1923; Emily Partridge Bacon, A.B., M.D., who, in 1924, succeeded Starkey as Associate in Pediatric Hygiene; and Marnetta E. Vogt, M.D., who was appointed a Lecturer in Gynecology in 1925 and promoted to Associate in Gynecology the following year. Elsewhere in the University, there were more than two dozen women who held appointments with the academic rank of Instructor or Assistant Instructor. In addition there were 30 women staff members in the University Hospital Training School for Nurses whose work was, at least in part, teaching of the student nurses. At least two of that number – Madge Timlin, R.N., the Director of Instruction, and Viola B. Brown, R.N., the Assistant Instructor – appeared to devote the majority of their time to teaching and training. At least two others – Mary Louise Snyder, R.N., who had held the position of Directress of Nurses since 1909, and Lucy Mastern, R.N., the Assistant Directress of Nurses – appeared to hold academic administrator positions. If so, they were the only two women Officers of Instruction at Penn in 1926 to serve the University as academic administrators. Marion Hague Rea (Mrs. B. Lucke), A.B., M.D., was Instructor of Medicine in the Department of Medicine in the School of Medicine (1920-46), Director of Health for Women (1922-31), and Student Physician for Women (1926-46). Mary M. Search was Superintendent of the Bennett Club from 1925-27. Board of Managers of the Hospital of the University of Pennsylvania included two women, Mrs. Chancellor Clement English and Mrs. Walter Smith Thomson. Board of Managers of the Graduate School of Medicine included Elizabeth Conway Clark and Celia Justine Nicholson. Mary Virginia Stephenson, R.N., was the Superintendent of the Hospital (1921-35) and had previously served as Assistant Directress and Instructor of Nurses in the Training School (1913-1921). Marion E. Smith had served as Superintendent of the Hospital from 1903 to 1921. No women among the six resident physicians, but two women – Julia Russell, M.D., and Katherine S. Andrews, M.D., among the twenty-two Interns. In the Medical Clinic of the Hospital, Elizabeth Glenn Ravdin, M.D., was the Henrietta Heckscher Research Fellow in Clinical Medicine. Lena R. Waters was Director of the Social Service Department. In June, Penn’s undergraduate women held their own Ivy Day ceremony, placing the first of many ivy stones on the Chancellor Street wall of the new Bennett Hall. Women had participated in the annual Hey Day program from the time of its establishment in 1916, but in 1926 the undergraduate men advised the women that they were no longer welcome. Women quickly responded by organizing their own Class Day and Ivy Day events and by 1931 had combined them in the Women’s Hey Day. Women maintained independent programs and ceremonies until 1968, when they were once again combined with those of the men. At the Commencement held on 20 June, the University awarded the Graduate School of Medicine’s degree of Master of Medical Science to Juanita Pearl Johns, Mary Campbell McIntyre, and Emily Lois Van Loon. They were the first women to earn the M.Sc. (Med.) degree at Penn. Anna Elizabeth Boyd (B.S. in Ed., 1929) was the first known President of the Panhellenic Council at Penn. The “Panhellenic Association” was in existence at Penn as early as 1925, when it was mentioned in The Bennett News, but the names of its presidents are unknown until 1929. At the Commencement held on 19 June, the University awarded the Graduate School of Medicine’s degree of Doctor of Medical Science to Juanita Pearl Johns (M.Sc. (Med. ), 1928). She was the first woman to earn the D.Sc. (Med.) degree at Penn. Dr. Johns was an ophthalmologist who subsequently practiced for more than thirty years at the Massachusetts General Hospital in Cambridge, Massachusetts and the Women’s Hospital in Brookline, Massachusetts. The Graduate School of Arts and Sciences appointed Anne Bezanson, Ph.D., to the faculty position of Research Professor in Industry. In March 1921, she helped found the Industrial Research Department of the Wharton School and became its Associate Director. She served as Special Lecturer on Industrial Management for the academic year 1924-25 and Lecturer on Industry for the year 1928-29. In 1929, she earned the degree of Doctor of Philosophy from Radcliffe College. She was the first woman to join the standing faculty in the Graduate School. She was also the first woman to earn tenure in that School or in any School of the University and the first to hold a senior professorship at Penn. 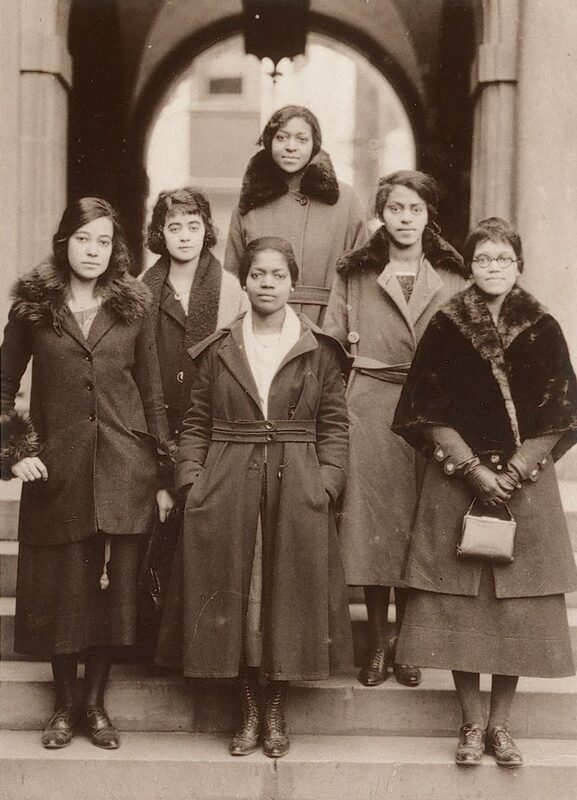 The women’s undergraduate Class of 1929 established a women’s Hall of Fame at the University of Pennsylvania. The Record of 1929 described the intentions of those who introduced this idea, “Five Pennsylvania women are herewith presented whom we deem highly deserving of honor and esteem. There are others we know to be worthy, and it is our hope that succeeding classes will carry on what we started.” The five nominees were Gertrude Klein Pierce Easby (Cert. of Prof. in Chem., 1878); Anna Lockhart Flanigen (Cert. of Prof. in Chem, 1878; Ph.D. in Chemistry, 1906); Margaret Center Klingelsmith (LL.B., 1898; Hon. LL.M., 1916); Louise Hortense Snowden (B.S. in Biol., 1898); and Ida Wood (Cert. of Prof., 1884). Mrs. Easby was married in 1884, soon became a mother, and was active in civic and social welfare organizations in Philadelphia. Dr. Flanigen was a professional chemist. Margaret Klingelsmith was Librarian of the Biddle Law Library of the Law School from 1898 to 1939. She was a translator of Norman-French digests of common law. Louise Snowden was Penn’s first Advisor of Women, a position similar to the University’s present day chief student affairs officer. When the Graduate Department for Women was established at Penn, Ida Wood was its first Secretary, serving from November 1891 to February 1893. At the Commencement held on 18 June, the University awarded the degree of Bachelor of Landscape Architecture to Edith Crosby Brown Stuart. She was the first woman to earn the B. L. Arch. degree at Penn. The women’s undergraduate Class of 1930 nominated four women – Anne Bezanson, Research Professor in Industry; Sigrid Anna Marie Nelson Craig (B.S. in Ed, 1916); Charlotte Easby Grave (A.B. 1921; A.M. 1922; Ph.D. in Psychology, 1924); Emily Lois Van Loon (M.Sc. in Med., 1928) – to the women’s Hall of Fame at the University of Pennsylvania. Professor Bezanson was honored as the “only full-fledged women Professor in the University.” Sigrid Nelson Craig was President of the Education Alumnae Association and Chairman of the Practice School Committee. Dr. Grave was a consulting psychologist in private practice (and daughter of Gertrude Pierce Klein Easby, one of the first two women to enroll at Penn in 1876). Dr. Van Loon was a Fellow of the American College of Surgeons, Chief of Otolaryngology at the Woman’s Hospital, and Assistant in Bronchoscopy in the Graduate School of Medicine at the University of Pennsylvania. At the Commencement held on 17 June, the University awarded the degree of Master of Business Administration to Alma Katherine Ledig (B.S. in Ed., 1926). She was the first woman to earn the M.B.A. degree at Penn. At the Commencement held on 20 February, the University awarded the degree of Master of Science in Education to Ida Marie Stadie. She was the first woman to earn the M.S. in Ed. degree at Penn. The School of Medicine appointed Florence Barbara Seibert, Ph.D., to the faculty position of Assistant Professor of Biochemistry in the Henry Phipps Institute. She was the first woman to join the standing faculty in the School of Medicine. In 1937 she was promoted to Associate Professor and became the first woman to earn tenure in the School of Medicine. In 1945 the University awarded her the honorary degree of Doctor of Science in recognition of her extraordinary discoveries on the detection and cure of tuberculosis. In 1955 she was promoted to Professor of Biochemistry, the first woman to hold a senior professorship in the School of Medicine. In 1959 she retired and was appointed Emeritus Professor of Biochemistry in the Phipps Institute. The Trustees elected Marion Edwards Park an Associate Trustee of the University and appointed her to membership on the Board of Graduate Education and Research. Dr. Park, President of Bryn Mawr College since 1922, was the first woman to serve as an Associate Trustee (the equivalent of a present-day appointment to one of Penn’s boards of overseers).